Something as outrageously-styled as the Chrome Cobra will always divide opinion, but judge it on its merits, and it's hard not to be impressed. It works as superbly as its long-standing non-chrome cousin and the execution of the pimped finish is fab - it´s also rather more affordable than its appearance might suggest. Looks stunning and doesn't cost over the odds. No one will see it at gigs. You won’t want to get it dirty. The gleaming, uber-bling Chrome Cobra has arrived. The Cobra is fast, responsive and powerful. Cool music equipment needs a cool name. It's unforgivable, to create something that sounds and looks ace and then refer to it by a series of forgettable letters and numbers. What's more evocative - 'snare drum SN1455BLK' or 'Black Beauty'? To be fair, most manufacturers are pretty good at coming up with decent product names these days - as they have to be if branding is to work effectively. But still a few real corkers stand out; even in the less-than-glamorous world of the kick drum pedal we have Eliminators and Avengers and, perhaps most celebrated of all, the Iron Cobra. The company evidently felt that the Cobra could wear a slicker set of clothes, however - at least for a limited period. And so the gleaming, uber-bling Chrome Cobra has arrived, limited to just 2,000 units for the single version and 4,000 doubles (presumably Tama reckon that well-heeled metallers are more likely to be queuing up to purchase the limited edition Cobra). Each of the Cobra's major components has been treated to the super-shiny finish, with only hard-working bits like springs and chains left untouched. But underneath the silveriness, it's all business as usual - and this being a Cobra, that's only a good thing. The Chrome Cobra is essentially a Power Glide Cobra under the skin (Tama offer the standard Iron Cobra pedal in Power Glide, Rolling Glide and Flexi Glide types - the latter two have a round-shaped cam and strap drive respectively), which means at the heart of the unit is an offset cam driven by twin chains. It's the most 'aggressive' option of the three in the Cobra range, and evidently the most popular among punters. The 'default' feel of the Cobra is therefore fast, responsive and powerful. This is a pedal that will work for a wide range of players from various parts of the rock'n'roll spectrum, and of course it offers masses of adjustability. And while the new finish might be extremely glam, the Chrome Cobra is still hard as nails - kind of like Henry Rollins in a dress. Iron Cobras have been the choice of countless thousands of hard-touring drummers through the years, and a big part of their appeal is their incredible robustness. They are super-reliable and this would appear to be unchanged where the Chrome Cobra is concerned. Baseplates, footplates and frames are all still suitably massive and, when locked on to a bass drum hoop, there's a solidity to the Cobra that inspires confidence and just feels 'right'. There's something about the chromed footplates that initially made us wonder if they were going to feel durable enough - we think it's the fact that they look a little less butch than the standard matt black of the Iron Cobra. But they proved to be just as hefty as we'd hoped. They are also less slippy than looks might suggest; the grip of the rough-surfaced black Cobra is missing, but the Iron Cobra logo cast into the surface of the footplate prevents too much wayward pedal action. All the other expected niceties associated with Iron Cobra ownership are present and correct too. The Para-Clamp hoop clamp means no fiddling with drum keys or reaching under the pedal to attach Cobra to drum, and the Quick Hook spring attachment speeds up set-up and breakdown. And that's the thing. This is 'just' an Iron Cobra - there's no performance-related benefit to the chrome version, the standard one works equally as well (with the added advantage of not needing to polish it all the time to keep it looking swell), so what's the point? 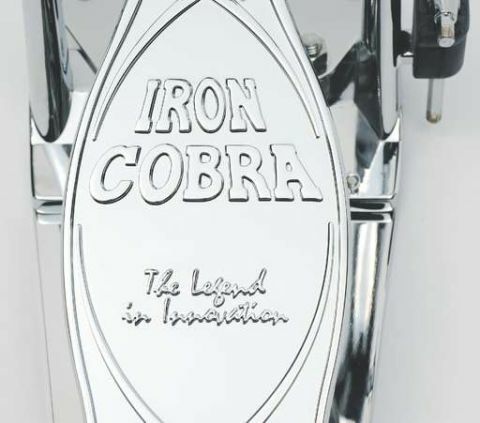 We're not sure that the Chrome Iron Cobra needs one. Sure, it'll sit behind your kit where no one but you can see it, it's flash for flashness's sake, and it's a completely unjustifiable purchase when judged in the cold light of day - but so what? It's also a beautiful thing to look at, it feels great to play and, importantly, it's a unique celebration of one of the best-loved pedals ever produced. It might be a collector's item rather than a pedal for every gig, but the fact that you could use it for every show if you felt like it means that it's more than just a museum piece.